Virgin Trains is launching their own on-board streaming app called Beams that will let you watch around 200 hours of TV and films whilst you are traveling on one of their trains. The app is free and so is the content and it allows for content to be streamed directly to your device whilst you are on the train. BEAM content includes a selection of classic and new films such as The Wolf of Wall Street, Breakfast at Tiffany’s, Bridesmaids, Theory of Everything and Despicable Me 2 as well as a mix of popular box sets and TV series from House of Cards, Poldark and Fortitude. To keep the kids busy, BEAM will have a separate section for children, playing popular TV shows like Peppa Pig, Ben 10 and Horrible Histories. A selection of leading magazines will also be available, including Newsweek, Men’s Health, Top Gear, Total Film, Hello, Grazia, Living Etc., Ideal Home and Marie Claire. To celebrate its launch, Virgin Trains has partnered with Hollywood blockbuster Independence Day: Resurgence, the sequel to the Oscar-winning Independence Day which is also available on BEAM.An Independence Day: Resurgence train-wrap is being unveiled at London Euston today, with presenter Alex Zane showcasing the new train design to director Roland Emmerich and cast members, Liam Hemsworth and Jeff Goldblum, who each have a carriage decorated with images of their characters on the side. 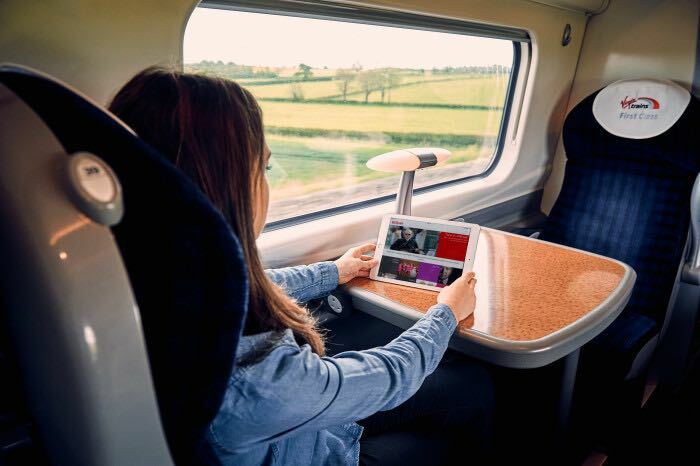 You can find out more details about this new streaming app from Virgin Trains over at their website at the link below.